The TC2050-ARM2010 is a Tag-Connect adapter board allowing our TC2050-IDC cables to be used for ARM JTAG and ARM SWD (Serial Wire Debug) applications. Although intended for use with our patented TC2050-IDC Plug-of-Nails™ Cables, the adapter may be useful to people wishing to use 10-pin 0.1” ribbon headers on their PCB. 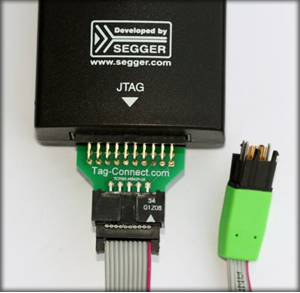 Picture shows Segger JLINK, an TC2050-ARM2010 adpater pcb and a TC2050-IDC cable. THIS IS THE ADAPTER PCB ONLY - TC2050-IDC sold separately.